The government has approved 10 sites in England and Wales for new nuclear power stations, most of them in locations where there are already plants. It has rejected only one proposed site - in Dungeness, Kent - as being unsuitable on environmental grounds. A new planning commission will make decisions on the proposals "within a year" of receiving them, Energy Secretary Ed Miliband told MPs. Nuclear was a "proven and reliable" energy source, he said. But environmental campaigners say it is an expensive and dirty option and the government could be open to legal challenges. The 10 sites deemed suitable for future nuclear plants are: Bradwell in Essex, Braystones, Kirksanton and Sellafield in Cumbria, Hartlepool, Heysham in Lancashire, Hinkley Point in Somerset, Oldbury in Gloucestershire, Sizewell in Suffolk and Wylfa in North Wales. Seven of the proposed locations are already home to nuclear plants while Bradwell was home to one in the past. Braystones and Kirksanton are the only new sites under consideration. Dungeness was rejected because of worries about the threat to the local eco-system from coastal erosion and flooding should a new plant be constructed there. Ministers hope to fast-track the construction of the new plants so that some can be producing energy by as early as 2018. Mr Miliband said the new Infrastructure Planning Commission would have to make a decision on each application within a year of receiving it, to avoid a repeat of previous lengthy inquiries. However, he insisted that people living close to the proposed sites would have plenty of opportunities to make their views known. The government decided last year to go ahead with a new generation of nuclear plants, lifting a previous moratorium on expansion. The majority of the UK's ageing nuclear infrastructure will have to be decommissioned by 2023, leading some experts to warn of the prospect of power shortages if capacity is not added. Plans for any plants in Scotland, which has two existing sites, are opposed by the SNP government. Mr Miliband said nuclear was one of a "trinity" of future fuel options, alongside renewables and clean coal, which would help to secure the UK's energy security and reduce its dependence on imported gas. Clean coal technology aims to trap and store CO2 emissions from coal plants underground, cutting pollution levels. However, it remains commercially unproven. "We need all of them in the long term because of the challenge of the low-carbon future is so significant," he said. 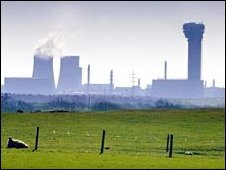 Most people living close to power plants were "enthusiastic" about them and the developments would create 9,000 jobs, Mr Miliband added. At the same time, he said the UK needed to do more to meet its renewables targets with more onshore and offshore wind farms. The Conservatives backed the expansion of nuclear power but warned that time was running out to prevent a "black hole" in energy supplies. "Every one of the measures contained in this statement should have been brought forward 10 years ago when they had the chance to secure the investments that are so desperately needed to keep the lights on, keep prices down and cut carbon emissions," said shadow climate change and energy secretary Greg Clark. The Liberal Democrats said residents near proposed sites risked being excluded from decision-making, saying what was "being disposed of is not nuclear waste but the democratic process". Greenpeace said the "figures did not add up" for new nuclear plants to be built without public subsidies. "You can't justify building more nuclear power stations when there is no solution to radioactive waste and when international regulators are saying there are huge uncertainties surrounding the basic safety of new reactor designs," said the organisation's Ben Ayliffe. The World Development Movement said a separate government decision not to rule out building coal-fired plants in the future would "shatter" the UK's credibility in future climate change talks. But employers' organisation the CBI welcomed the announcements, saying: "These planning statements will help reassure companies that the government has a clear strategy for delivering new nuclear power, clean coal and renewable energy plants, and that this will be reflected in planning decisions."